When it comes to making predictions by experts, 2016 has been a terrible year. In June, the polls were forecasting a win by the Remain side, yet the Leave side won the vote in Brexit by a whopping 4%. That’s a big margin of victory. In November, the polls forecast a 75-95% chance of Hillary Clinton winning the next presidential election. Yet here we are, only a few weeks away from President Donald Trump. Back in June, most odds-makers gave the Golden State Warriors the most likely chance of winning the NBA Championship, and the situation looked especially likely when they went up 3 games to 1. Yet unlikely as it was, the Cleveland Cavaliers came back to win the championship. In October, most people thought that the Cleveland Indians would win the World Series when they went up 3 games to 1, yet the Chicago Cubs came back to win their first World Series in nearly 500 years. With that said, this past Sunday the Ottawa REDBLACKS beat the Calgary Stampeders to win the Grey Cup, Canada’s Football League championship. This wasn’t supposed to be a close game, Calgary went 15-2-1 during the regular season and dominated teams. Ottawa bumbled their way to an 8-9-1 record, taking first in the east division but only because every other team stunk. I predicted that Calgary would blow out Ottawa. I checked http://cfl.ca and all six sports writers picked Calgary. After the game I checked out http://3downnation.com for their predictions, and 5 out of 6 picked Calgary. This means 11 out of 12 picked Calgary to win, and I also did. Even when Calgary was down by 20 points halfway through the third quarter I thought they would win. When they were down 10 points with two minutes to go I thought they would win. When they went to overtime I still thought Calgary would win. And then Ottawa did, and I was shocked. That city’s first championship in 40 years. But the wisdom of the experts isn’t doing well this year. For the past week, I’ve been fighting a cold. Last Wednesday I woke up with a sore throat. It wasn’t that bad and I went into work, and overall I wasn’t feeling too bad until Saturday evening, and this carried through to Monday when I was coughing, sneezing, and my nose was running. Still, I felt okay enough to go in. However, over the past two years I’ve changed my “working while sick” strategy. I used to power through it and just be miserable the entire day, but still go into work. Now, I decide to work from home so I don’t infect others. Even though I can be self-contained, I don’t want to spread my germs to the kitchen, bathroom, the hallways, etc. No one likes to be sick, and I think it’s a courtesy to ensure no one else gets sick, either. [Incidentally, that’s the same reason I get the flu shot; while I may not need the shot, I could spread the disease to someone else with a weaker immune system. Also incidentally, when work goes to open-office space instead of private offices, I am worried about how much easier sickness is going to spread when people who are ill come in and there are fewer barriers to germs spreading. I came home from work Monday morning suspecting I’d be feeling worse the next day. So I brought home all the equipment I needed to work from home the next day – audio headset, cable to VPN into the office… and that’s it. The next morning, I set up office in the dining room. 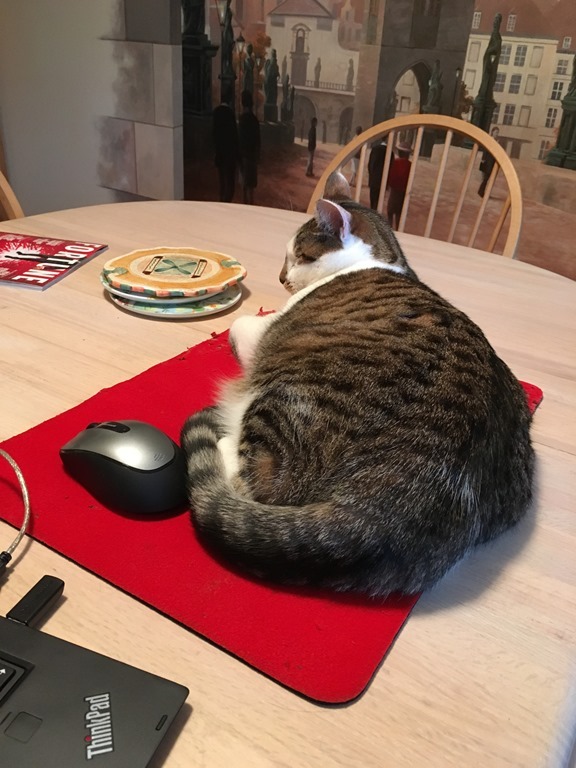 At the dining table, I just set up my laptop, got out a mouse, and then headed upstairs to get an old magic close-up mat to act as a mousepad. 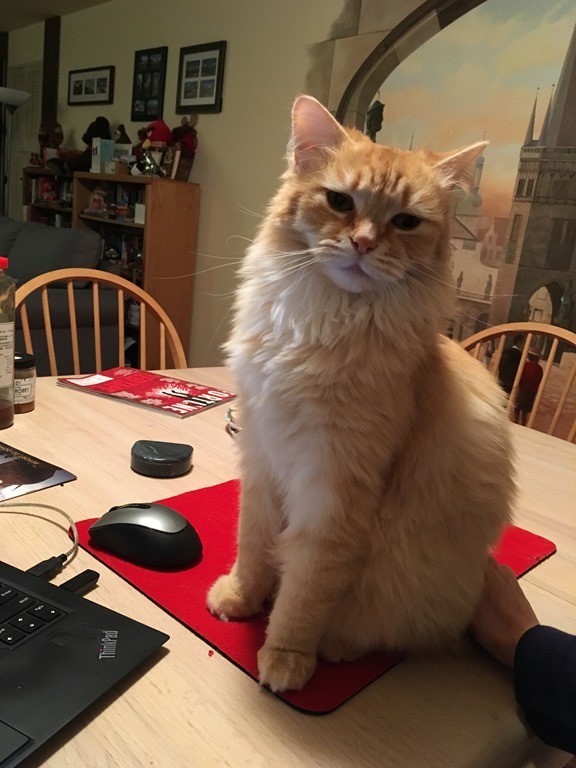 The dining table is not a good surface to work on. I picked her up and put her on the floor 4 (!) separate times, and each time she jumped back up. 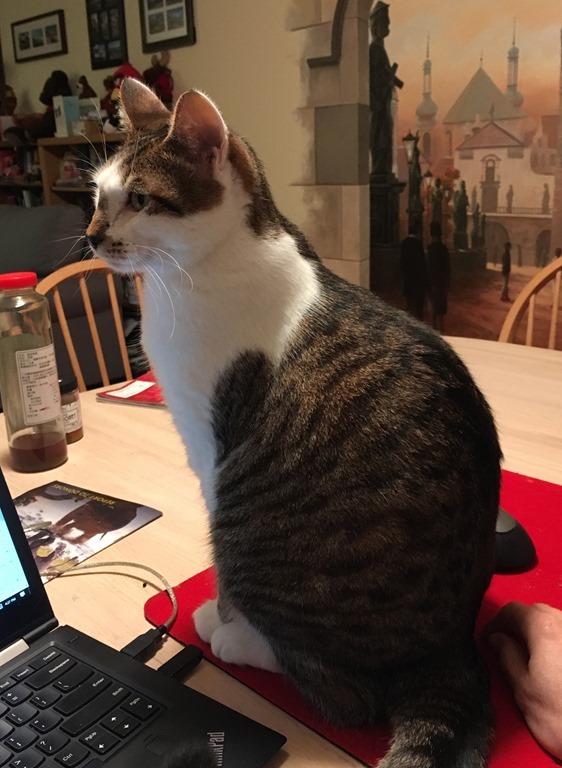 Eventually she crawled across the front of the computer and laid across my arm while I was typing. That’s unusual because Zelda isn’t normally that cuddly. Eventually she moved on and I got work done (I was surprisingly efficient that day). But two hours later, Ruby showed up wanting some attention. 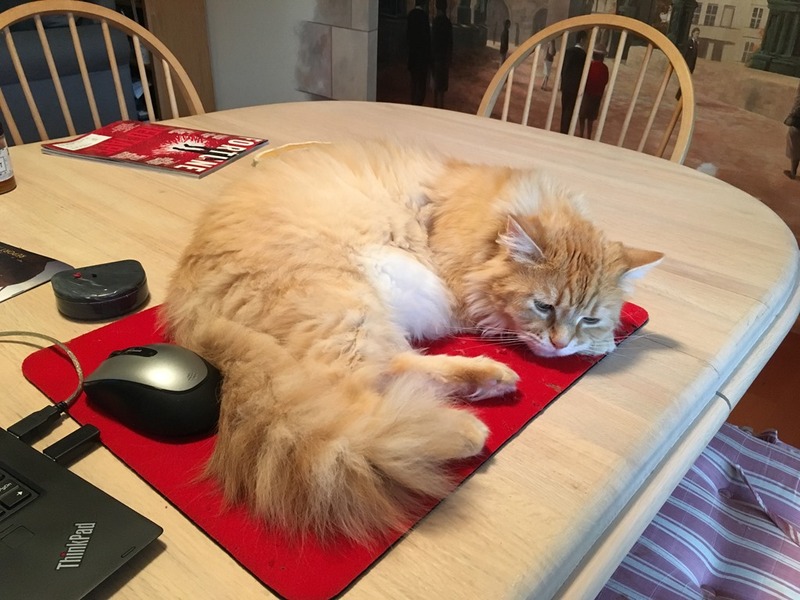 She jumped up on the dining table, and laid down on the mousepad. She stayed there for a while, too. This one didn’t surprise me, because Ruby likes to cuddle with people. But eventually, she got tired and moved on and I was able to get some more work done. I picked her up and put her down a couple of times, but when this one wants attention, she wants it. I gave up trying to put her back down, and accepted that she was going to shove her head, and back, in my face for the next few minutes. Eventually she had her fill and moved on. Now, both of these cats know they are not supposed to jump on the kitchen table. Occasionally they do it anyhow. Usually it’s because they are snoopy, but on a day like today (or rather, the day I was working from home), it’s because they want some attention. So I gave it to them. I guess their plan worked. Okay, so now it has been a week and a half since Donald Trump won the presidency. I accepted it a while ago (about 72 hours after), and now I’m ready to move on. The 2016 election is done. I get that people are upset about the election, it was stunning to me, too. So, there’s some lash out. While some protested, in the following week, a lot of charities like Planned Parenthood raised record amounts of donations. But I think those will fade away as people start to come to acceptance of what just happened. The time to come out and organize against the election of Donald Trump was during the campaign. The campaign is now finished, your side (and mine) lost. The next goal are the 2018 mid-terms and the 2020 elections. Yet I see these protests as drumming up sympathy for Donald Trump. He hasn’t even done anything yet and people are organizing against them. That’s not going to pull the far-right (who always vote conservative) and the middle-ground centrists (who flip/flop) onto your side. If anything, it will drive a wedge against the Democratic party and prevent people from flipping sides next time. I think that if these protests don’t fade away, they will generate a backlash effect where people will vote for Trump again just to spite the protestors. Remember, I’m tired of people crying wolf, and people are still crying wolf! Donald Trump is one of those uncommon situations where he lost the popular vote (currently trailing by 1.6 million votes) but won enough states individually to take the Electoral College. There is a movement afoot for the Electoral College in states that Trump won to instead vote for Hillary. This extends the 2016 election even more. I’m against this. It’s done. First, this is the way the situation is set up and we all understood it. It’s not like we didn’t know this could happen. If you want to get rid of the Electoral College, then you should do it when your party has power, not because your side lost. We all had fair warning that this is how it worked. Except that Constitution is set up explicitly to prevent exactly that. It tries to ensure that one section doesn’t get too much power. So, New York and California would have a lot of voting power without the Electoral College, because the more rural states are losing a lot of their affluent people to the coasts, causing an economic Matthew-Effect. Yet there are still people left behind who live in those states that didn’t leave. In order to counterbalance this, the framers of the Constitution try to prevent one side taking too much power, and the Electoral College means that you have to be aware of all the US states, even ones that proportionally have “too much” power. In reality, they are a smaller economic bloc and have much less sway in public opinion, but their political power makes up for that gap. The whole point of the US Constitution is the separation of powers and setting up a system of checks and balances. The writers were influenced by the Enlightenment and the need to constrain the power of governments, but also of the majority. It’s fine to complain about the Electoral College when it goes against you. But you’re certainly thankful for it when the system works in your favor, and one day it just might. I currently pay attention to who Trump is putting in his Cabinet. I was holding my breath when I saw some undesirables get nominated, but some of the potential ones look interesting. For example, I see the possibility of Mitt Romney being nominated for Secretary of State. That’s hopeful, because even though I was for Obama in 2012, I thought Mitt Romney was capable of being President. He’d be fifth in line to the Presidency (after the VP, Speaker of the House, and longest-serving Senator). But for the most part, I get up, go to work, come home, make food, and go to bed (and talk to the wife, and bug my cats, of course). I still have plenty of things to do during the day and they didn’t change at all the day or week after the election. I understand that there are some people who’s live may change for the worse after Trump assume the Presidency in January; with massive increases in deficit spending and repeals in public health care, that will be potentially bad for some. There may even be a recession brought on by some of Trump’s tax policy (i.e., putting 35-45% tariffs on imports from China or Mexico). But I will deal with that when the time comes. For now, I am watching, and going about my life. I have more important things to worry about. This is so because we humans are innately inward-focused, that’s how natural selection designed us (accounting for natural selection, kin selection, and reciprocal altruism). The fact is that we don’t care about other people’s plights as much as our own absent of some underlying influence… That’s not the way it should be, but it is the way our species works. And I didn’t say it in the blog post, but the book also says that natural selection didn’t make other species altruistic, and humans are no exception. So you say voted for Trump but you’re not a racist. But he said racist things, so that’s obviously not a deal breaker for you. The sentiment is that while people voted Trump out of their own self-interest due economic concerns, they should have seen that Trump’s racism was a disqualifying factor and they should have instead acted against their own (perceived, real or not) self-interest by voting against him. During the Democratic National Convention, Hillary Clinton said she believed in science, that is, she accepted the reality of human-caused climate change. And her followers cheered. Yet the science says that people act in their own self-interests most of the time, and now we are surprised that they did not? Come on, now. That’s not how people act in real life. To be sure, people do act against their own self-interest, but their motivations are complex. Shaming people into doing it doesn’t work. And remember, I’m saying this as a guy who voted for Hillary Clinton and got others to vote for her, too. So that’s what I’m thinking right now. It has now been over a week since Trump beat Clinton in the 2016 election, and my views, while still fuzzy, are getting clearer. And the main thing I am is this – disillusioned. First, I am disillusioned with pollsters and Big Data. At no point during the campaign was Trump winning except in July when he temporarily spiked during the Republican National Convention. He briefly closed the gap after Clinton’s “basket of deplorables” comment and Sept 11 fainting spell due to pneumonia, but he never led. Then, on Nov 8, he won. That’s why it hit me like a sack of potatoes, I was expecting a Clinton victory because this came out of no where. All of the big data models, simulations, polling… all worthless! None of them foresaw a Trump victory. 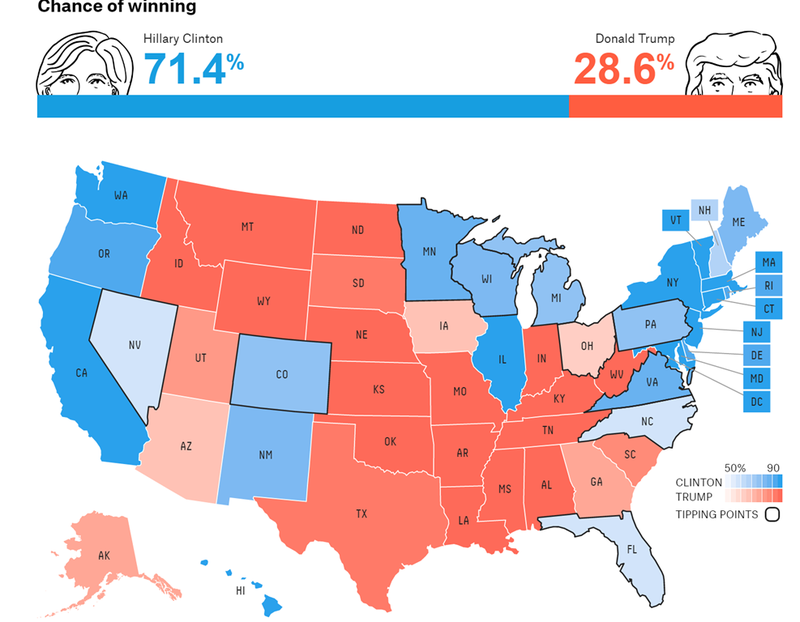 538’s forecast was better than most, it gave Trump a 29% chance of winning, and it was the most optimistic. The others gave Clinton a 80-99% chance of victory. But you know who did forecast it? Michael Moore, back a few months ago in his article 5 reasons why Donald Trump will win. And all of his reasons were right! Alan Lichtman, a professor at American University who uses 13 keys in a True/False fashion to make a prediction about who will take or keep the White House, and it has nothing to do with polls. He ignores them because he says they aren’t predictive of anything. I read through his 13 questions, and only two of them have something to do with the candidates themselves. The rest are all easily answerable based upon the previous 4 years. Now, I heard both of these predictions during the campaign because I said “These are not based upon data, they are projecting their beliefs onto the campaign and they may be right or may be wrong, but it will be by accident.” Anyone can fit data to a curve. But all the Big Data we had proved to be wrong, and conjecture and insight turned out to be right! When I realized that, I became disgusted with data analysis. Whenever anyone says “data-backed evidence” or “evidence-based decisions”, I snort and roll my eyes. “Evidence-based data” said Hillary would win. Look how that turned out. The media did everything in their power to discredit Donald Trump. For nearly every newspaper in the country, to economists, to websites, to late night comedians, they all attacked and criticized and jumped on the Trump Bandwagon-of-Doom (except Fox News and some far-right websites). They threw everything they had at him… and missed it completely. Yet do we hear any of that on late night comedy? No! We hear rant after rant after rant of him hiring Steve Bannon, the former chief of right-wing Breitbart News. Now, it’s starting to look to me that Donald Trump may not be an ideologue, he just may be an opportunist that jumps on a movement only to abandon it later. As a businessman (of questionable skill, it turns out), that’s what you have to do. I know nothing of Steve Bannon, but he may be the same. After all, he’s in the entertainment industry. I have no idea. It’s entirely possible that Bannon is a crazy person… but the press and late night comedy has burned all of their credibility in trying to shoot down Trump and completely missed the people who supported him; they whiffed on any of the critical insight necessary to foresee a Trump victory. I wrote a few months ago that if you have 100 friends on Facebook with opinions on politics, maybe 2 of them have opinions worth listening to. I am probably not one of those two. Nearly everyone on my Facebook feed was anti-Trump (which tells you something of the circles I run in). Well, maybe closer to 80%. Yet these people shouted “Racist! Xenophobe!” at Trump… but said the same thing about Mitt Romney in 2012. And John McCain in 2008. And George Bush for 8 years. So when Donald Trump came along who really did espouse racist rhetoric, it didn’t work because they had exhausted their credibility on people who didn’t show those signs, such that now when we had people do show it, we don’t believe them. That goes hand-in-hand with my above disillusionment with the media. These same people who cried “Xenophobe!” during the campaign are shouting it now at Steve Bannon. Did you really learn nothing at all? This is covered in this blog post over at the excellent blog Slate Star Codex: You are still crying wolf. The first 24-48 hours I was sympathetic to people who were worried about Trump’s extremism. But that’s because I was similarly distraught. But now… I am rolling my eyes because I don’t trust my left-wing friends to be able to tell the difference between true prejudice and showmanship. It’s now been almost a week since Donald Trump won the election for President of the United States. I’ll be honest. I voted for Hillary Clinton. I didn’t really like Clinton that much when she was a Senator, but I don’t have a good reason for it. But while she was Secretary of State, I came to like, admire, and respect her. When she announced her candidacy, I was like “Yeah, she’s actually a hard worker and pretty good at what she does.” When the email scandal broke, I couldn’t have cared less. For nearly the entire campaign, I thought Clinton was going to win. There were periods when I was really nervous, like when the polls showed her odds of winning were down to 55% in mid-to-late September, and right after the Republican convention in July. But even right up until election day, I thought Clinton was going to win. I knew it would be close, and I knew (thought) that Clinton would have a hard time governing due to Republican obstruction in the House and possibly the Senate. One thing was nagging me – was there too much time left on the clock? Back in September, the Winnipeg Blue Bombers nearly beat the Calgary Stampeders, the best team in the league. The Bombers scored a touchdown late in the game with 20 seconds to go to take the lead. That was fantastic, but one thing concerned me – had they left too much time on the clock? It turns out they did because Calgary got the ball back, two long passes later put themselves in field goal position and won the game on the last play. When Trump’s Access Hollywood tapes became public, it was October 9. His numbers plummeted, giving Clinton almost a 10 point lead. I figured “Whew, hopefully that sinks him.” But I wondered, was there still too much time left on the clock? Was there time for Trump to recover, the story to fall out of the headlines, and another scandal to take its place? That turned out to be true because in late October the FBI made an announcement, and then I got worried. Then I read on 538 that it was possible Clinton’s Blue Firewall had been breached in New Hampshire. That portended a set of bad signs. But, I figured her Blue Firewall could carry her to just over 270 votes in the Electoral College, and she would be come the 45th President of the United States. I left work and Hillary Clinton had a slight lead. I came home and checked an hour later and she was slightly behind. As time passed, I checked my Facebook feed over and over again, and checked various websites over and over again looking for different results. It was clear that she was going to lose this election! And when reality set in later that night, it hit me like a ton of bricks – Donald Trump won. I was shocked, stunned, flabbergasted. How could this be? My stomach tightened up and I started stressing out. I only slept a couple of hours that night, tossing and turning the whole time. “How could this be? Now what will happen?” I freaked out about public education funding; health care for the uninsured; environmental protection; marriage rights for the LGBT community; and the list went on. I got up the next morning (earlier than normal because I wasn’t sleeping), and had only a single piece of toast. I wasn’t hungry. I went to work that day, but was distracted. I couldn’t focus. I ended up taking a half-day of sick leave because I knew I wasn’t being effective at my job. I came home and moped. But then, I forced myself to start reading a lot of post-mortem articles. Writers were assuring me not to panic. I listened to a couple of podcasts, talking about the Trump phenomenon and what it meant, and what it didn’t mean. And the reality that Trump lost the popular vote (by what is currently 700,000 votes) meant that his mandate is tenuous. It’s hard to do unpopular things if the country is not behind you, particularly if you didn’t get more votes than your opponent. And then I started feeling better. Much better. My initial aversion to Trump is explained in my other blog post about his wall proposal. My fear was that his campaign’s xenophobic rhetoric would cause racist behavior to go up because when people of a higher social class act that way, it signals to others that it’s okay to do that. According to Time, racist threats have increased since the election of Donald Trump. This was entirely predictable, as I pointed out. What I was afraid would happen has happened, and it both disgusts and saddens me. Even though Trump and his supporters may say that’s not what he wanted, he is responsible for legitimizing it. Donald Trump did go on 60 Minutes and tell his supporters to stop harassing minorities. And that’s great. But I fear that it will be difficult to undo. As a white guy, I’ve never had anyone say anything racist towards me; that wouldn’t make sense. However, I was bullied constantly in school, from 7th grade up until 12th. I was probably bullied even earlier than that, I just can’t recall it that clearly anymore (other than a handful of incidents). When you’re bullied, your ability to fight back depends upon your ability to build coalitions of allies; if you’re not popular (like I wasn’t), you can’t fight back. You have to sit there and take it. You can’t tell an authority because if you do, word gets around that you are a tattle-tale and then you get ostracized even more. You literally have no way to fight back against a bully who has no restraints against them. So I understand what it’s like to be harassed, I hate bullies, and that’s part of why I was anti-Trump – I perceive him to be a bully. Yet even my harassment is nothing compared to what it’s like to be ganged up on by roving gangs of testosterone-fueled young males, either by being a minority or a woman. That’s not something I would have wished upon anyone, and I feel like Donald Trump unleashed it. While he is walking it back, it will not be as easy as it was to unleash it. Even though I am feeling better, I still feel somber because of what I’ve explained above. But, now what’s done is done, and I have no choice but to accept Trump as the next President of the United States. It’s been said that we all have to hope for his success. I completely agree with those words.